10 Christmas Traditions – In the Midst . . . In the same manner that the Israelites had their traditions to remember their heritage and what God had done for them, many families have holiday traditions. These practices help create family memories and solidify bonds. Because of our family constitution (step-children and “other” parents), we have been creative in establishing traditions. We recognize the importance traditions hold, so we continue to instill them into our lives but follow them loosely. By that I mean that we aren’t bound by them or bothered if we have to change a few things around to fit our schedule. For example, a few years ago when Christmas fell on a Sunday we followed our “Christmas morning ritual” on Christmas Eve morning. 1 – Christmas Tree – We have our pattern. Don and the children build the tree (we go artificial here), and I put on the lights. Some church ladies taught me how to weave the lights in and out of the branches which makes for a more illuminated and prettier tree. The children then decorate with our unsophisticated store bought and homemade ornaments. A few peculiar ones remind us of stories and cause us to laugh. And we each have our “special” ornaments. 2 – Christmas Music – On this point I am a stickler: Christmas music may not be played until after Thanksgiving. After that I listen to it as often as possible, and we always play it while assembling the tree. We have our favorite CDs – the ones that generate a, “Remember this . . .” comment or story – and usually add to the collection each year. 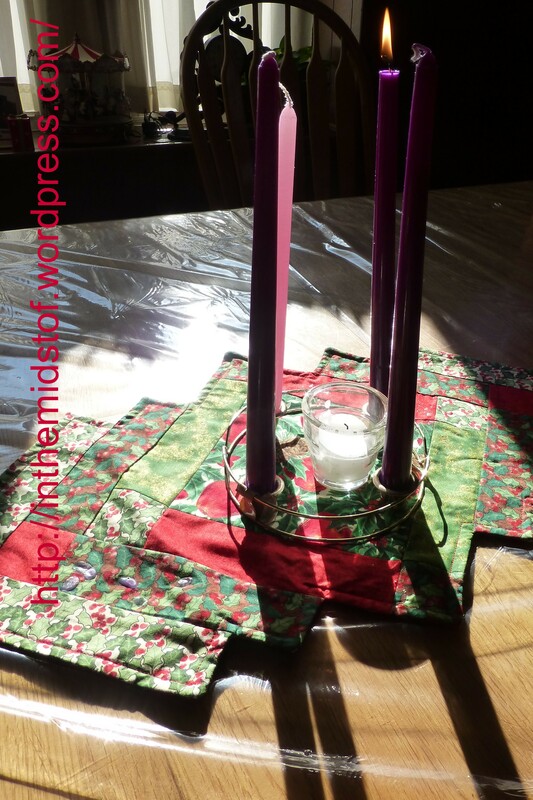 3 – Advent Story – While we maintain a flexible schedule, we read part of an advent story and light advent candles each day during advent. When our older boys were in Kindergarten I stumbled on a story entitled Jotham’s Journey. The next two years I purchased the other two books in the series. Since that time, we have rotated through them, reading one each year. The stories aid us in focusing on the purpose of our celebration, Christ and His birth. They also remind us how to live and assist us in looking forward to His second coming. 4 – Anonymous Gift – Each year our family gives an anonymous monetary gift to a family or person in need. This tradition reflects what Christ has done for us and teaches our children the gift of giving. 5 – Foods & Crafts – Some foods smell like Christmas! During this season I bake more, and the children spend more time making crafts (remember those homemade ornaments mentioned in #1?). 6 – Christmas Eve Service – We have attended services at several different churches and enjoy the awe and wonder inspired by candlelight, quiet hymns, the reading of the Christmas story, worshiping with God’s people, and other blessings a Christmas Eve service includes. 7 – Christmas Breakfast – Don is a great cook and enjoys serving a big breakfast as part of our celebration. But I must admit we don’t always have this breakfast on Christmas morning. If we are traveling (which has been the case for the past few years), we adapt by having this meal on a different day. 8 – Quiet Exchange – Don and I prefer to exchange gifts without the children around, so we usually break ours out after the kids go to bed Christmas Eve. 9 – Exchange Gifts & Stockings – We do not purchase elaborate or expensive gifts, but we do participate in the giving of gifts and stocking stuffers. I think it’s fun and the kids enjoy selecting presents to fit each family member’s personality. More recently we have established a routine as to when and how we open gifts, but in the past we have been flexible on our plans as usually there was one or two family members missing on Christmas morning. Periodically we allow the children to open a gift or two Christmas Eve but usually open on Christmas morning (unless we are traveling). 10 – Extended Family – This is the time of year my heart aches for those I grew up with. Both Don’s family and mine are spread far and wide throughout the United States. Unfortunately we are unable to visit with most of them but, when possible, we drive to my mom’s. I pray these traditions help my children connect Christmas with family and Christ’s birth. I’d love to hear from you! In the midst of this holiday season, what traditions will you be including in your celebration? This entry was posted in of Life, of Marriage, of Parenting and tagged advent, birth, calendar, candles, Christ, Christmas, family, music, story, traditions, tree. Bookmark the permalink. We are a blended family, too, and must be flexible. We have a tradition of lighting a special nativity candle once a year and reading from Luke 2. Helps us not lose the true meaning of the season. Thanks for chiming in! I haven’t heard of a nativity candle. Sounds like a brilliant idea.